The history of CAMA begins in the fall of 1919 when a group of community-minded Santa Barbarans came together in the optimistic years following World War I to create the Civic Music Committee. Their intention was to present the finest in musical performances, including the new Los Angeles Philharmonic, founded by philanthropist William Andrews Clark, Jr. that same year. The group’s work was taken over by the Community Arts Association’s Music Branch in 1926, which in time evolved into today’s Community Arts Music Association (CAMA). Since the 1920s, CAMA has presented such legendary artists as Pablo Casals, Sergei Rachmaninoff, Vladimir Horowitz, Jascha Heifetz, Igor Stravinsky, Artur Schnabel, Isaac Stern and Marian Anderson, with yearly performances from the Los Angeles Philharmonic. Since the 1950s the orchestra series has expanded and the concert annals now include virtually every great orchestra of the world, from the New York Philharmonic to the Royal Concertgebouw Orchestra. With the end of the First World War in 1918 the United States enjoyed a new flowering of the arts. In Los Angeles, William Andrews Clark, Jr., a successful attorney, gifted musician and son of “Copper King” and former Montana Senator William Andrews Clark, Sr., decided to found a new Los Angeles Philharmonic Orchestra – even though Los Angeles already had a struggling Symphony Orchestra. Clark, Jr. provided the initial funding, selected and hired a musical director, set up a Board of Directors of prominent citizens, auditioned and hired musicians from around the country, started rehearsals on October 13, 1919, hired Trinity Auditorium and on the Friday afternoon of October 24, gave the first sold-out performance to an audience of 2,400, including Clark, Sr., by then a Santa Barbara resident. In Santa Barbara, also in 1919, a cadre of music lovers formed and attempted to bring major out-of-town musical events to Santa Barbara. This organization, known as the Civic Music Committee, had planned and contracted their first season of musical presentations by late 1919. Bertha D. Soper chaired the Committee. South Coast benefactor David Gray, Sr., who would finance the construction of Santa Barbara’s Cabrillo Pavilion Arts Center in the 1920s was on the original committee and contributed financial support. 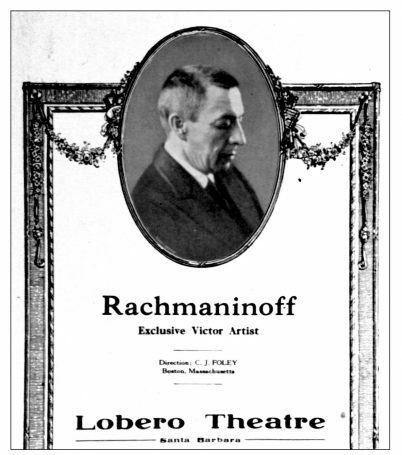 The Civic Music Committee’s first concert event took place on Tuesday, February 3, 1920 at the Potter Theatre with a presentation of the Los Angeles Symphony Orchestra. (The Potter was destroyed in Santa Barbara’s great earthquake of June 29, 1925.) The (now defunct) orchestra of ninety musicians arrived by train from Los Angeles. The second concert of the 1920 Season was on Tuesday, February 17, also at the Potter: a recital by violinist Amy Neill, with Mary Cameron at the piano. Amy Neill’s connection to the music of composer Henry Eichheim (1870-1942), who moved to Santa Barbara in 1922, may explain her appearance as the Civic Music Committee’s second act at the Potter. The third and final concert of the Civic Music Committee’s inaugural season was by the newly founded Los Angeles Philharmonic Orchestra. This concert, given on the Saturday evening of March 6, 1920, just four months after the orchestra’s creation, was presented to a sold-out audience of 1,110 at the Potter Theatre. Maestro Walter Henry Rothwell (former conductor of the St. Paul Symphony) led ninety musicians in a program of Schubert’s “Unfinished” Symphony No. 8, Two Nocturnes (“Clouds” and “Festivals”) of Debussy, Wagner’s Overture to Tannhäuser, Liszt’s Symphonic Poem No. 4 “Orpheus,” the Intermezzo and Rondo from Lalo’s Concerto for Cello (with Ilya Bronson as soloist) and Chabrier’s Rhapsody for Orchestra, “España.” The fee for this first LA Philharmonic concert in Santa Barbara was about $1,000. Advertisements in local papers listed ticket prices from 50¢ to $2. 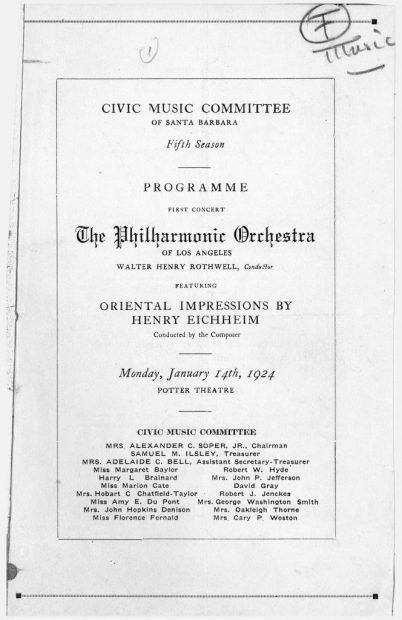 This first appearance by the Los Angeles Philharmonic established an ongoing relationship between the Santa Barbara community and the LA Philharmonic that continues to the present. Looking back to 1919, in addition to the founding of the Los Angeles Philharmonic and Santa Barbara’s Civic Music Committee, a drama-oriented committee was formed to present an open-air spring festival in Santa Barbara called “La Primavera.” The new committee decided initially to call themselves the Community Arts Players and later the Community Arts Association. Their pageant, with a cast and crew of over 300, involved music, dance and drama, and was presented on Friday, May 28 and Saturday, May 29, 1920. “La Primavera” was a popular and critical success, but a financial disaster. The group tried again in the late summer and presented “The Quest,” an historical pageant with scenes from Greek history, the Middle Ages, Elizabethan times and the Renaissance. It too was well-received but financially intractable. Thus, the first Community Arts Association disbanded. Within weeks, a new group formed with many of the same members and the same name: Community Arts Association (CAA). This time, with a $50 loan, they set off on a mission to organize, foster and support the arts in Santa Barbara. Mrs. Hilmar Koefod and Miss Pearl Chase were on the committee. On April 24, 1922, the group obtained a charter as a nonprofit corporation. The mission of CAA from its Articles of Incorporation was “to afford individuals an opportunity for self-expression, training and education in music, drama and the allied arts and to aid in the cultural improvement of the people and in the beautification of the City of Santa Barbara” (CAMA archives). Community Arts Association was soon organized into four branches: (1) the Santa Barbara School of the Arts (independently instituted and subsequently amalgamated with CAA), (2) the Drama Branch, (3) the Music Branch and (4) the Plans and Planting Committee (added in 1922). The Music Branch held its inaugural committee meeting at 4 pm on a Sunday in March 1921. (The exact date was not recorded in the minutes; March 13, 1921 is the current “best guess,” based on the dates of subsequent meetings.) The meeting was held at 111 W. Valerio Street in downtown Santa Barbara, then home of Lydia A. Herter, daughter of Adele and Albert Herter, whose grand estate was El Mirasol, converted in 1914 into the El Mirasol Hotel, presently Alice Keck Park Memorial Gardens. At the inaugural meeting Adele Herter was elected as the Music Branch’s first chairman. In attendance was Samuel M. Ilsley, the architect of 111 W. Valerio, as well as the house next door, and many others in Santa Barbara. 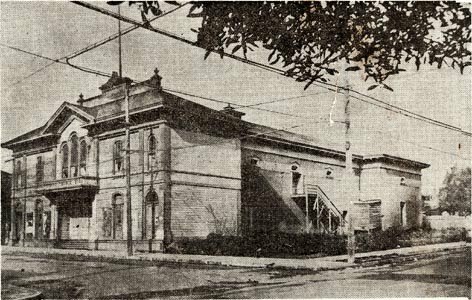 In the fall of 1921, CAA began planning for the purchase of the old Lobero Theatre, which had fallen into disrepair, as a home for its Drama Branch. In February 1922, a group of investors purchased the property for $25,000 and organized the Lobero Theatre Company. The investors agreed to turn the property over to the CAA Board in exchange for its equivalent in stock of the Theatre Company if $75,000 worth of stock could be sold within six months. In less than three weeks, $101,000 was raised in addition to the $25,000 purchase price (1922 CAA document, CAMA archives). Upon inspection of the original structure of adobe, brick and wood, the decision was made to build a modern theater in its place. Architects George Washington Smith and Lutah Maria Riggs began plans for the project and the theater was constructed during the winter and spring of 1923-1924. On August 4, 1924 the Lobero Theatre was ready for its historic reopening with a performance of “Beggar on Horseback.” The event was celebrated by a Fiesta with a costume pageant and several parades. This celebration has continued annually as Old Spanish Days Fiesta. The year after the new Lobero Theatre was finished, it came through the 1925 earthquake undamaged. The Music Branch continues as CAMA to this day and is the only one of CAA’s four branches active in its original constitution. This Music Branch was offered a fully financed concert orchestra led by Georges (also called “Roger”) Clerbois in 1921. Clerbois, a graduate of the Conservatory of Music of Brussels and of the Schola Cantorum of Paris, was a composer and director of the Clerbois Little Symphony. The new orchestra gave its first concert in March 1921 as the Community Arts String Orchestra. Its first venue was the old Recreation Center (100 E. Carrillo Street). Each concert, including rehearsals, cost about $700 to present. Tickets were priced from 25¢ to $1 for a single ticket and from $1.25 to $5.50 for a season subscription. The first series included six concerts held from March to May 1921 and additional series followed. The Music Branch sponsored music classes and summer lectures by Donald Francis Tovey, Reid Professor of Music at Edinburgh University; and formed a Community Arts Chorus with Lyle Ring as its first director. The Chorus was subsequently led by composer Arthur Bliss (1924-1925), who later became Director of Music at the BBC during World War II; and then by Harold Gregson (1925-1928). On June 19 and 20, 1926, the Community Arts Chorus presented (with orchestra) Charles-François Gounod’s grand opera Faust, with Helene Portune as Marguerite and Harold Dana as Méphistophélès. In May of 1927 the Chorus presented Camille Saint-Saëns’s opera Samson and Delilah. Beginning in Fall 1922, the Carnegie Corporation of New York granted CAA an annuity of $25,000 over five years in recognition of its work and as a means of widening its scope. The grant was facilitated with aid from Dr. Henry S. Pritchett, a former President of MIT, President of the Carnegie Foundation, and a Santa Barbara resident. In 1925, after the great earthquake, this grant was extended to run five years past that date with the addition of $25,000 toward losses from that catastrophe. The CAA Plans and Planting Branch oversaw much of the rebuilding in Santa Barbara in the Spanish Colonial tradition of architecture. With encouragement from the Branch, the City of Santa Barbara set up an Architectural Board of Review and a Community Drafting Room. From 1921 to 1925, the Civic Music Committee continued to present concerts by the Los Angeles Philharmonic and recitals by prominent classical musicians including soprano Maria Ivogün and cellist Pablo Casals. In 1925, the CAA Music Branch and Georges Clerbois parted ways; and, in 1926, the Civic Music Committee disbanded. At that time, the CAA Music Branch took over the responsibility for sponsoring the annual series of Los Angeles Philharmonic concerts. By the 1926-1927 season, the CAA Music Branch Board included such notables as Amy duPont, Frank A. Mulhauser, T. D. Plumer, Ethel Roe Eichheim (Vice-Chairman) and Mrs. Francis Price. The Associate Membership fee for 1926 was $1. Sustaining Members could join with a contribution of $5, $10 or $25. From 1926-1928, the Music Branch of CAA supported seven different simultaneous concert series and numerous other musical activities, including: the Los Angeles Philharmonic; the Persinger String Quartet Series (performing as far afield as Toronto, Canada with CAA support); the Community Arts Chorus Series; the Artist’s Series (of famous soloists); summer Community Band Concert Series; summer Children’s Chorus; and the Community Arts Orchestra “Pops” Series. During this time the CAA Music Branch also founded a men’s chorus, taught music education and performance classes, gave away music scholarships and provided strolling musicians on State Street for Fiesta activities. In July 1926 the Morning Press announced that Major Max C. Fleischmann would provide a gift of $5,000 to create public band concerts for Old Spanish Days Fiesta. Fleischmann was the son of the founder of Fleischmann Yeast Company and a financier for the construction of the Santa Barbara harbor and the expansion of Cottage Hospital. The first band concert was held at the Plaza Del Mar Band Shell (constructed in 1919) on July 27, 1926. A committee from the Community Arts Association hired Los Angeles bandleader Signor Indreani for the occasion, who brought with him musicians from John Phillip Sousa’s marching band and the Los Angeles Philharmonic Orchestra. Fleischmann continued to finance band concerts for the next two years. In September 1928 he created the Santa Barbara Foundation along with Harold Chase, Thomas Storke, Dwight Murphy, Bernhard Hoffmann and others. The Foundation’s first grant was awarded to the Santa Barbara Band, to be administered by the CAA Music Branch. After the 1929 stock market crash there was an inevitable streamlining and tightening of the focus of the Music Branch’s key objectives. Nonetheless, the organization continued to present an unbroken series of concerts by the Los Angeles Philharmonic and other series presenting the greatest living classical artists. Soloists appearing in CAA recitals in the 1920s included Pablo Casals, Tito Schipa, Efrem Zimbalist, Walter Gieseking, Sergei Rachmaninoff, and more.